Legend of Lititz and Legend of Lancaster are partnering with exciting program Eldergrow to launch a unique new gardening program for residents. The program helps residents with Alzheimer’s disease and other dementias establish a mobile, indoor therapy garden. Eldergrow instructors will visit twice a month to lead classes in horticulture, garden art, and cooking with homegrown ingredients. Eldergrow founder Orla Concannon will talk to residents’ friends and family during the kickoff event about the benefits of horticulture therapy. Then each resident will select a seedling and plant it in the new Eldergrow garden. Legend communities are the first in Pennsylvania to use Eldergrow. 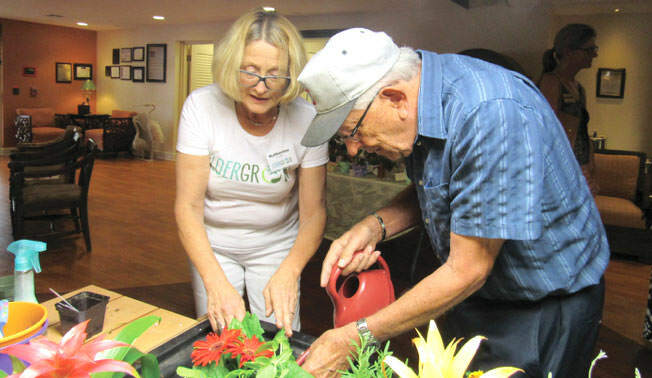 Therapeutic horticulture programs like Eldergrow can help residents improve their motor skills and provide a setting for meaningful social and sensory interaction. Recent studies have shown decreased agitation, improved sleep patterns and balanced hormones in dementia patients who participate in nature-based activities. To learn more about Eldergrow, visit their website.